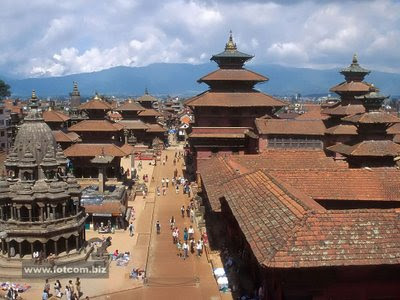 My little district in Kathmandu, Gairidhara, surrounds Nepal's main Saraswati Temple. Saraswati is the Hindu goddess of music and learning, and every year on her festival day thousands of kids flock to the shrine to get their pens and notebooks blessed. It's one of those neighborhoods where you can find just about anything, from skin-lightening cream to motorcycle seat reupholstering shops. This suits me well - because whenever I return to Nepal, I prepare to take advantage of a quality that has not changed a bit since my Buddha-shopping days: the Nepalese ability to fix anything. In the late 1980s, I delighted in snapping photos - admiring photos - of umbrella repair stands and disposable lighter refilling stations. For a few years I sheepishly brought my old lighters back to Nepal to be reconditioned, although I never got as far as umbrellas. Since then, I've abandoned all pretense of shame and usually fill a suitcase with items that would have to be thrown out, or replaced, in the United States. Among the personal possessions rehabilitated on this journey: a $65 ThermaRest pad, leaking at the seams (repaired at a bicycle tire mender for 15 rupees, about 20 cents); my Timberland expedition hiking shoes, which, though incredibly comfortable, are separating at the soles (20 rupees); my carry-on computer case, in need of a new leather carrying handle (60 rupees); and my $125 Sennheiser collapsible noise-canceling headphones, with amazing electronics but wires so cheap they're worn down to a few copper threads. The minimum repair charge for these babies on the Sennheiser site is $55, plus postage. I paid my friendly Gairidhara electrician (who fixes everything from toasters to laser printers) 50 rupees, no bargaining involved. There's a strange sense of liberation that comes from knowing that anything can be fixed, and that a beloved jacket, or pair of shoes, is essentially immortal. During my stopover in Bangkok, my friend Jock pulled an ancient down jacket - his companion on uncounted Himalayan odysseys - out of the closet. It was leaking feathers like a ruptured pillow. I took it to a Kathmandu trekking gear shop, where a bemused Sherpini named Shona told me to come back in three days. I picked it up, good as new, for the price of a used CD. Emboldened by that success, I brought an old pair of shorts to the neighborhood tailor. They were the most comfortable shorts I'd ever owned. I wore them here in 2002, and I was wearing them still - mainly in private, as the crotch area was worn through and keeping no secrets. Back in Oakland, you can't get an ice cream cone for 85 cents; but that's what it cost to bring those shorts back from the dead. But enough of the small stuff. A couple of years ago, my friend Chrissie - one of Kathmandu's most gifted yoga teachers - developed a cataract in her left eye. Cataracts are endemic to the Himalayas, where smoke, dust and a high level of ultraviolet light may all contribute to the clouding of the eye's sensitive lens. Last week, Chrissie visited a local eye surgeon - trained in Melbourne - and had her lens replaced. The cost was 9,000 rupees: $120. Asked to choose between the American-made replacement lens and the locally-made variety, she chose the Nepali: "It's made to last 120 years," she said, "that should be about long enough." Just for kicks, I'm thinking of getting an MRI. There's a place that does them right down the block, between the open-air vegetable market and a popular breakfast joint. Honorable as the passion for re-use may be, it's easier to appreciate from a distance. Last week, 12 Indian day laborers took over the vacant field beneath my living room window. Within days, the former flower bed had been turned into a scrap metal reclamation center. Where pastoral views and bird calls once accompanied my morning coffee, I now watch bicycles roll up laden with old oil cans, bent bicycle rims, used wheelchairs, tin cans, obsolete disk brakes and acres of rusty tin roofing sheets. From dawn to dark-thirty the workers attack this booty with huge mallets and iron chisels, reducing everything to its atomic components. It's like living next to the rehearsal room of a amateur junkyard band. I'm all for recycling - but not in my lap, please. In general, the endless recycling is both admirable and necessary - especially in a country where the per capita income hovers around $150 a year. That's not to say the Nepalese don't like new things. Right now, in the days before the huge Dashain holiday (honoring the goddess Durga, who rides a tiger and in some depictions wears a necklace of severed heads), the shopping centers are packed with families buying new clothes, new appliances, and other upscale holiday gifts. But as fast as items like iPods and CFC-free refrigerators hit the market, the crafty repairmen tucked into ramshackle shops will learn how they work, and how to fix their complex circuits with a touch of solder, a rubber washer and the tiny spokes from a broken toy truck. Which brings me back to my long-held conviction that millions of dollars could be saved if the United States government got a clue, and started a variation of what the British did with the Gurkhas in the 19th century. The most ingenious and efficient Nepalese street repairmen should be found, and recruited - not as soldiers, but as astronauts. In orbit, they could repair anything - from faulty space station toilets to the Hubble Space Telescope - using needle nose pliers and few paper clips, for about the cost of a new toaster. The sad truth is, the Chinese will probably get to them first. Meroguff:These(above) are the time-proof words published(about Kathmandu and people recycling electronic stuffs) on San Francisco Chronicle last year on October and written by Jeff Greenwald. I've had couple of email exchange with the writer and he sounded profound Nepal lover. He already gave me the permission then to publish his article on my blog, but it's my fault that I never got any chance to turn it in. Finally, here with his wonderful article about Kathmandu and it's people and how they recycle electronic stuff. To reach Jeff Greenwald, visit his blog here.